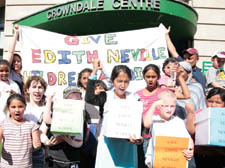 EDUCATION chiefs have already begun their search for architects to redevelop Edith Neville School – even though plans to transfer another school to share the site have not been agreed and remain the subject of huge controversy. Opponents to the “co-location” of the primary school in Ossulston Street, Somers Town, and Frank Barnes School for Deaf Children have accused the council of jumping the gun before a final decision has been made. The New Journal has learned that adverts aimed at recruiting architects for the project will be sent out across Europe on Monday, three weeks before Camden’s cabinet of senior councillors are due to finalise plans. Campaigners had thought this period would allow them time to put their case for a rethink, but their hopes of changing the council’s mind have now taken a blow and there are fears that advanced work is going on behind the scenes. More than 800 objectors had taken the time to sign a petition or write letters to the council before a deadline for comments on the scheme passed on Tuesday afternoon. Children from the school delivered the feedback to council offices with the familiar chant of “hear our voice” and were clearly under the impression that their views would be given a fair hearing. Frank Barnes is being evicted from its current site on the corner of Adelaide Road in Swiss Cottage to make way for Camden’s first city academy, a secondary school sponsored by University College London. Governors at Edith Neville argue that while they respect the work of Frank Barnes, the co-location would harm the education of children at both schools by squeezing them into the same site. Hundreds of parents, teachers, governors and children marched on the Town Hall last month as part of demonstrations against the plan.